​And what is the Wonder? Who is Alice? Where is Wonderland? and What is the wonder? 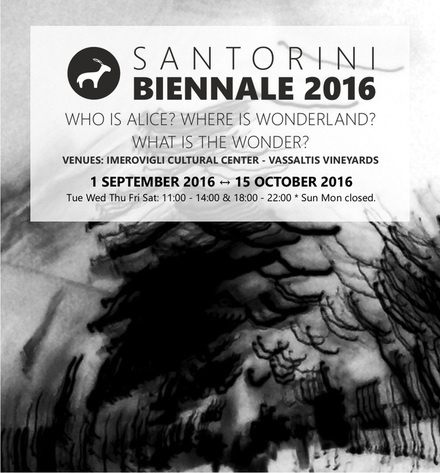 - These were the central questions for the theme of the 3rd International Santorini Biennale 2016. In a time where everything is moving fast while cultural, humanistic and religious boundaries are questioned, human life has become complex and especially difficult for those living in fear, without home and shelter, without food or even worse without love. Ernesto's participation in the Santorini Biennale with two of his paintings is his artistic response for those facing this struggle with a symbol of energy and strength. "The idea to paint "I am Alice!" was born on a flight from London to Hamburg in January 2016 while I was reading a newspaper report about the refugee children that had to travel and walk with there families through the cold in order flea their homes in hope for a better life somewhere else. Single children that had lost their family, following the track, traumatized, regardless without any other meaning in life. But still being a child. 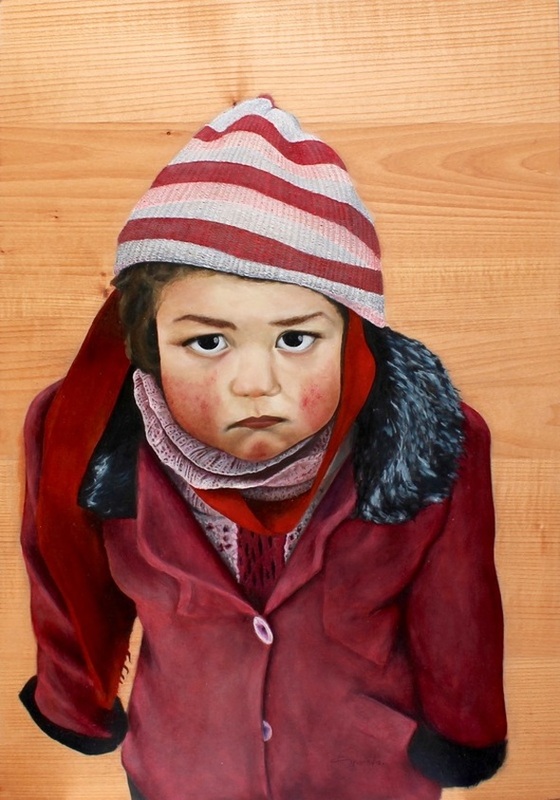 I had to do this painting and I was painting everything I could into Alice' little face. Every emotion I could imagine going through a child's head in this situation - anger, resignation, rage, sadness, hope, trust, guilt, fear, confusion, yearning, courage and playfulness every warm string of human emotion." The work as intended is a way of humanistic criticism. Not only a certain part of society is being indicted but in fact every adult individual in the position of both offering help and acting in a responsible manner It is meant to be a call and reminder to look after minors and embrace them as the future of this world, accept their raw emotionality, offer guidance, shelter, food or education and all above love. "The Time" is a sequel to "I am Alice!". Both works communicate to each other. The colours overall are reflections and reminders of the other work. But ever so different is the scene and perspective in "The Time". 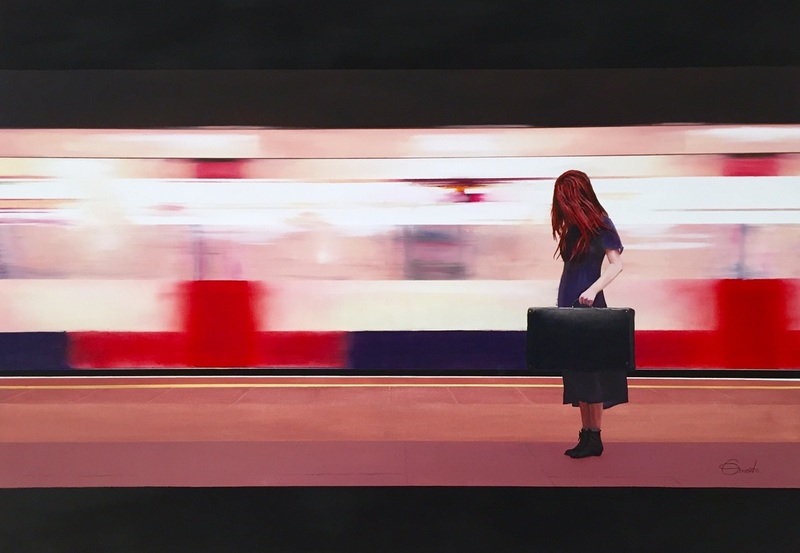 Alice is a grown-up modern, West-european girl that seem to pause in contemplation while a London tube train is passing with high speed. "Thinking of where everything goes including ourselves and why we search for something that makes us happy - there in-between moments lies time. We rush for fascination, satisfaction, joy and happiness but have to overcome time. Time to wait, time where we struggle or suffer. We are in search and the only thing that makes us deal with time is the ability to think. We have the chance to put time into perspective and can be cool about it. But there is this human side within an old ancient set of human emotions that have the power to conquer the thinking in any moment. Fear, love and hate. It lies just beneath our sophisticated surface of routines. Alice is thinking back of Alice and still feels the same. She is traveling her whole life at any given moment be it standing still or be it on a train." "The Time" stands a reminder of each and everyones finiteness and the appeal to fill the time with intention, value and consideration about what to search for and where to go in life.